If you hang a simple feeder outside your window, you might attract this Black-capped Chickadee and many other birds. Fill the feeder and install it close to any room where you spend time. Hang the feeder within three feet of the window to keep the birds from colliding with the glass. That way, if they do, the impact is less damaging since they haven't gained much speed. Support for BirdNote comes from Audubon Park Wild Bird Food, family-owned and celebrating National Bird-Feeding Month. This is when birds need the most help. Info at audubonpark.com. Does this birdcall sound familiar? 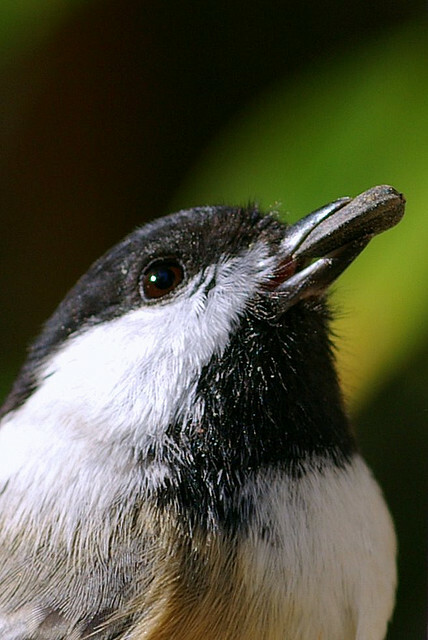 It’s the Black-capped Chickadee. Listen again. The singer, a small grayish bird with a dapper black and white head, dresses to match its snappy call. Would you like to hear this call outside your kitchen window? Then hang a simple feeder to attract this chickadee and many other birds. Right now is a good time to begin feeding birds. Our resident seed-eating birds are out and about, searching for tidbits. Once they find your feeder, they’ll add it to their daily hunting grounds. To attract these seed-eating birds, you’ll need two things: a hanging tube-feeder and a bag of black sunflower seeds. Fill the feeder, and install it close to any room where you spend time. Hang the feeder within three feet of the window to keep the birds from colliding with the glass. That way, if they do, the impact will be less damaging because they won’t have gained much speed. Then watch for these perky, four-inch birds—the males and the females look alike. They’ll dart in and peck for seeds. Your reward may be an impromptu concert. 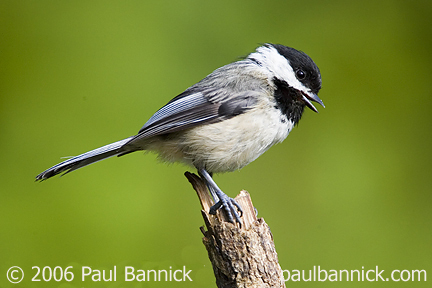 Let’s listen again to the Black-capped Chickadee. Sound recordists: R.S. Little and S.R. Pantle.